After decades of failed Tuareg secessionist rebellions, a separatist group, the National Movement for the Liberation of Azawad (MNLA) has declared an end to military operations in northern Mali, having achieved their objective: military control of the three regions of Gao, Kidal and Timbuktu, which will form a new state. A separate Islamist group, Ansar Dine, which has different objectives from the MNLA and seeks to impose Sharia law in Mali, also took part in the fight and claims to have wrested control of Timbuktu from the MNLA - high tensions are reported between the two groups. Below is a chronology of key events. July 1891: Colony of Soudan Français (French Sudan) created, including much of what is today Mali. December 1893: French troops occupy Timbuktu but encounter strong resistance in the city and surroundings area. 1911: Revolt in Ménaka by KelAtaram people crushed by French military. 1913-14: Severe drought in northern regions aggravates poverty in Tuareg areas and fuels growing grievances. 1914-17: Rebellions against the French led by Firhoun - elected Supreme Chief, or Amenukal, of KelAtaram in Ménaka - and by Kawsanag Kedda, who led siege of Agadez in what is now northern Niger. Both revolts are put down by French with assistance of rival Tuareg confederations and Arabs. Rebels face severe reprisals. September 1960: Senegal withdraws from the Federation of Mali. 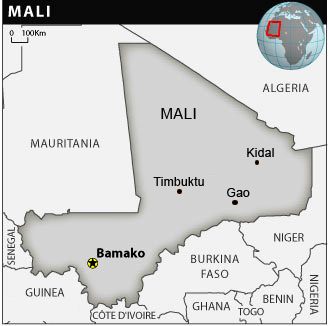 The former Sudanese Republic is renamed the Republic of Mali and independence is proclaimed in Bamako, the capital. Modibo Keïta, a school teacher and trade unionist, is appointed President of the Republic. Constitution adopted. 1962-64: First Tuareg rebellion in the north, known as the Alfellaga, is launched from Kidal region and violently repressed. Government troops target Tuareg communities, wipe out livestock and poison wells. The war triggers a major Tuareg exodus to Algeria and other neighbouring countries. Government military clampdown continues in the north. December 1968: Military coup removes Modibo Keita, who is imprisoned. Army officer Moussa Traoré, leading the Comité Militaire de Libération Nationale (CMLN) - Military Committee of National Liberation - eventually takes over presidency. 1972-73: Mali hit by extreme drought, with devastating impact on the north, forcing a new wave of migration to urban centres and across Mali’s borders. Reports later surface of major misappropriation of food aid by the authorities. 1976: Traoré establishes political party, l’Union démocratique du people malien (UDPM) - Democratic Union of Malian People. Mali adopts a one-party system. 1984-85: The worst drought in over a decade has crippling effect on pastoralist communities and the northern rural economy. 1988: Founding in Libya of the Mouvement Populaire de l’Azaouad (MPA) - Popular Movement of Azawad - under the leadership of Iyad Ag Ghali. May 1990: Tuaregs in northern Niger attack Tchintabaradene. Fierce military reprisals follow, leaving hundreds of Tuaregs dead. June 1990: Tuareg rebellion begins with attack on Ménaka, targeting the prison and garrison. Widespread violence triggers a renewed exodus of civilians. 6 January 1991: Peace agreement brokered by Algeria at Tamanrasset in southern Algeria focuses on decentralization of the north and reintegration of Tuareg troops, but violence continues in parts of north. January-March 1991: Strong crackdown by authorities on protests by students and trade unions in Bamako leaves heavy casualties. 26 March 1991: Overthrow of Traoré and establishment of transitional government, Le Comité Transitoire pour le Salut du Peuple (CTSP) - Transitional Committee for the Salvation of the People - headed by military officer Amadou Toumani Touré. July-August 1991: National conference in Bamako draws wide range of delegates as Mali attempts to establish a functioning democracy. 12 January 1992: New constitution overwhelmingly adopted by referendum. 11 April 1992: Signature of Pacte Nationale by government and umbrella grouping of Tuareg rebels. Pact focuses on economic regeneration of north, local reconciliation initiatives, decentralization and integration of Tuaregs into military and civilian structures. April 1992: Alpha Oumar Konaré, former minister, UN consultant and newspaper and radio owner, wins first multiparty elections. His party, Alliance pour la démocratie au Mali (ADEMA) - Alliance for Democracy in Mali - wins parliamentary elections. January 1994: Devaluation of CFA franc by 50 percent brings major rise in living costs and leads to protests. May 1994: Despite a series of peace initiatives at grassroots and national level, tensions worsen in the north, particularly between Songhai sedentary communities and Tuaregs and Arabs, resulting in formation of the Songhai-based Malian Patriotic Movement Ganda Koye (MPMGK). (Ganda Koye - “masters of the land” in Songhai). January 1995: Accords of Bourem signed by MPMGK and mainly Tuareg Front Populaire pour la Libération de l'Azaoud (FPLA) - Tuareg Front for the Liberation of Azawad - marks significant breakthrough in defusing inter-ethnic tensions. 27 March 1996: ‘Flame of Peace’ ceremony at Timbuktu as hundreds of firearms are destroyed and Tuareg armed movements are formally dissolved, along with MPMGK. June 2002: Amadou Toumani Traoré elected president despite having previously ruled out a political comeback. 2005: Mali hit by severe drought. Pastoralist communities are again severely affected. April 2005: Promulgation of decree introducing the Agence de Développement du Nord Mali (ADN) - Agency for the Development of the North - prioritizing investment and development in regions of Gao, Timbuktu and Kidal. April 2006: Libyan leader Colonel Muammar Gaddafi is among guests of honour at the Maouloud festival in Timbuktu, commemorating the birth of the Prophet Mohammed. Visit draws criticism from Malians who accuse Gaddafi of sponsoring Tuareg revolts in the past. May 2006: Attacks on garrisons at Kidal and Ménaka by new rebel movement, the Alliance démocratique pour le changement du 23 mai (ADC) - May 23 Democratic Alliance for Change. 4 July 2006: Accords of Algiers signed by government and ADC, with peace agreement focusing on need to bring security and economic growth to Kidal, Mali’s 8th region and the most remote from the capital. May 2007: Violence continues after Alliance Touareg Niger-Mali (ATNM) - the Niger-Mali Tuareg Alliance - rejects Algiers Accords and continues operations in the north, attacking garrisons and kidnapping soldiers under the command of Ibrahim Ag Bahanga. November 2007: Former Tuareg leader Iyad Ag Ghali joins Malian consulate in Jeddah, Saudi Arabia. February 2009: Successful government counter-insurgency in north includes dismantling of rebel military bases, but generates fierce hostility from some Tuareg communities, who complain of being victimized by government troops. February 2009: Kidal peace ceremony includes surrender of hundreds of weapons by Tuareg rebels and new arrangements for their incorporation into armed forces, but Bahanga’s combatants remain outside peace process. Analysis: Warriors and websites - a new kind of rebellion in Mali? November 2010: Meeting in Timbuktu, attended mainly by Tuaregs from the north, ends with foundation of Mouvement national de l’Azaoud (MNA) - National Movement of Azawad - which rejects violence but calls for display of solidarity from Azawadians inside Mali and beyond the country’s borders. August 2011: Six months on from the Kidal ceremony, Touré launches the Programme spécial pour la paix, la sécurité et la Paix et le développement au Nord-Mali (PSPDN) -Special Programme for Peace, Security and Development in the North - with a budget of CFA32 billion (around US$65 million), focusing on security, employment, women and youth projects and income-generation, and backed by the European Union (EU), World Bank, UN Development Programme (UNDP) and other donors. The programme is headed by Mohamed Ag Erlaf, a Tuareg from Kidal. August 2011: Reports of arrival in Malian territory of heavily armed Tuaregs coming from Libya via Algeria and Niger. 26 August 2011: Death in a car crash of Ibrahim Ag Bahanga, leader of ANTM. Bahanga was believed to have been heavily involved in the recruitment of Tuareg combatants from Libya. 16 October 2011: Creation of Mouvement National pour la libération de l'Azaoud (MNLA) - National Movement for the Liberation of Azawad. The Mouvement national de l’Azaoud (MNA) - National Movement of Azawad (MNA) - fuses with the more hardline ATNM. The new movement defines its main objective as “to free the people of Azawad from illegal occupation of Azawadian territory by Mali. November 2011: Civil society organization in Gao warn of worsening security problems in the region. January 2012: MNLA accuses the government of military provocation and a series of broken promises, and launches rebellion attacks on Ménaka in far north. The movement says its objective is “winning peace and justice for the Azawad community” and “stability for our region”. 17-31 January 2012: After initial rebel attacks on Ménaka, further fighting reported in different parts of the north, including Ageul-hoc, Tessalit, Léré, Andéramboukane and Nianfunké. Contradictory reports on military gains and losses from Malian military and MNLA, but government army reported to be losing ground. Human rights organizations, including Amnesty International, condemn government’s handling of the war and use of military helicopters against civilian targets. Reports surface of massacre of government troops at Aguel-hoc after being taken over by MNLA, triggering rumours of MNLA alliance WITH Salafist Muslim extremists. Rebels strongly deny allegations. 1-2 February 2012: Protests in garrison town of Kati, 15km outside Bamako, directed at the Touré government for conduct of the war, and at the local Tuareg community. Political leaders and civil society activists warn against extremists using the situation in the north to stoke inter-ethnic tensions. Amnesty International accuses security forces of doing nothing to prevent attacks on houses and property belonging to Tuaregs, Arabs and Mauritanians. President Touré broadcasts appeal for calm and unity on national television. 2 February 2012: Talks open in Algiers between government of Mali and representatives of former Tuareg rebel movement, the ADC. They end two days later with appeal for peace, but this is dismissed by MNLA as irrelevant. 3-4 February 2012: Reports from Kidal of attempted rebel push on the town. 7 February 2012: Population abandons Tessalit in far north as rebels reportedly lay siege to the town. 8 February 2012: Rebels take Tinzawaten in the far north. 17 February 2012: The UN Refugee Agency (UNHCR) estimates that 44,000 refugees have fled into Niger, Burkina Faso and Mauritania. Heads of state from the Economic Community Of West African States (ECOWAS) meeting in Abuja, the Nigerian capital, express concern about the deteriorating humanitarian and security situation in Mali, condemning the MNLA rebellion and giving unreserved support to the efforts of Mali to defend its territorial integrity. 18 February 2012: MNLA attacks Hombori, a town on the main road between Mopti and Gao. Rebels deny government accusations of killing a military chief in the area. 21 February 2012: Government commission reports back on Aguel-hoc and confirms the killing of government soldiers by AQIM combatants collaborating with MNLA. The report is strongly denied by MNLA. 24 February 2012: In an interview with Radio France Internationale (RFI), Touré maintains that elections will go ahead and Mali will have a new President on 10 June. 26 February 2012: Collectif des ressortissants du nord Mali - Collective of Nationals from the north of Mali (COREN) - meets in Bamako and adopts action plan on restoring state control of the north, stressing the need for protecting populations under threat. 10 March 2012: Mali’s spiritual leaders issue a joint call for peace and dialogue. 10-11 March 2012: MNLA takes control of Tessalit, close to the Algerian frontier, while Malian military talks of ‘strategic withdrawal’. 13 March 2012: Former Tuareg leader Iyad Ag Ghali sends out video claiming that the Ansar Dine movement, first reported on in December 2011, has played a key role in the conflict, but is fighting for imposition of Shariah law and not a separate Azawad. 15 March 2012: In an interview with French daily Le Figaro, Touré blames the rebellion on fall-out from the Libyan conflict and accuses AQIM of supporting the rebellion. Touré says the government is ready for dialogue, but rules out any partition of Mali. 21 March 2012: Soldiers mutiny at Gao and Bamako, protesting against poor leadership of the war and their lack of resources. Mutinous troops converge on the presidential palace and ORTM-TV station headquarters. Sporadic gunfire reported in Bamako. 22 March 2012: In a dawn broadcast, a group of soldiers describing itself as the National Committee for the Restoration of Democracy and Rule of Law (CNDRE) announces coup, blaming Touré for poor handling of the war. CNDRE declares suspension of the constitution, announces a curfew and closes frontiers. Many shops and businesses remain closed in Bamako. Ousted president Touré’s whereabouts not known, but he is reported to be safe. Several ministers and leading politicians detained. Coup brings instant condemnation from the United States and the African Union. MNLA restates its objective of securing independence for Azawad. 29 March 2012: ECOWAS leaders’ mission to Mali cancelled for security reasons. Leaders convene in Abidjan, Côte d'Ivoire, where they issue warning to CNDRE to quit power within 72 hours or face wide-ranging sanctions. Burkina Faso President Blaise Comporé confirmed as ECOWAS mediator. 30 March 2012: Rebels in control of Kidal, capital of Mali’s northernmost region, after clashes at military bases outside the town. Witnesses confirm presence of combatants from both MNLA and Ansar Dine. 31 March 2012: MNLA confirms capture of Gao. MNLA reports defection to its ranks of Colonel Major Elhadj Ag Gamou, a former rebel commander who has headed government military operations in the north. In MNLA communiqué issued from Kidal, Gamou calls on “all Azawadis to join and strengthen the MNLA in its struggle for independence”. Muslim and Christian leaders call for peace at a stadium rally attended by 25,000 in Bamako, urging both Malian leaders and regional heads of state to work for dialogue. 1 April: Reports from Timbuktu point to an Ansar Dine takeover from MNLA, and chasing away MNLA combatants. Reports of widespread looting in Gao as rebels take over. 2 April: ECOWAS leaders impose wide-ranging sanctions on military junta. The ECOWAS Chairman, President Alassane Ouattara of Côte d’Ivoire, confirms that “All diplomatic, economic, financial measures and others are applicable from today and will not be lifted until the re-establishment of constitutional order.” Non-ECOWAS members Algeria and Mauritania back the measures. Aid operations in the north are largely on hold. 3 April 2012: Military junta leaders ignore ECOWAS demands to immediately exit from power, repeating instead their demand for an open-ended transition to civilian rule and reinstatement of constitutional law. 4 April 2012: Civil society organizations and some 50 political parties refuse to take part in discussions with junta leaders on Mali’s future. 5 April 2012: The UN Security Council calls for a ceasefire in the north and a return to democracy. The MNLA announces an end to military operations in northern Mali, having achieved their objective. 6 April 2012: The MNLA declare independence of the northern region of Azawad, calling for a unilateral ceasefire.